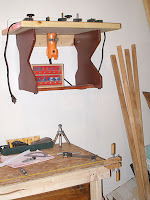 In Part 1 of this Benchtop Router Table series, I shared my design and the assembly of the legs. In Part 2 I assembled the top and finished the legs, then joined the two together using dadoes in the underside of the top. 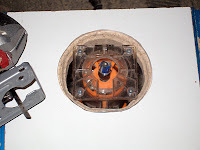 All that remains for this, Part 3, is the fence, the router mount, and the cleats to hang the table from the wall or other convenient location. 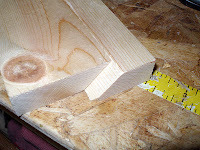 To make the cleats I ripped a 1x4" piece of pine at a 45 degree angle as shown in the picture above. One half is mounted to the wall with the point away from the wall, the other half gets mounted to the table between the legs butted to the underside of the top with the point away from the table. 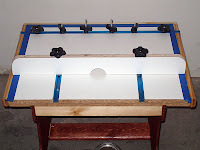 The table can then be set on the cleat mounted to the wall. 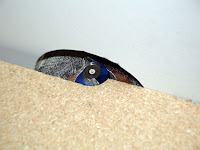 The angle of the cut pushes the weight of the table against the wall so all the weight isn't on the screws holding the cleat to the wall. Very efficient design that can hold a lot of weight. After it was assembled I applied 4 coats of wipe-on polyurethane to the pine edging around the top and the cleat mounted to the back. I couldn't force myself to use any more of that "cherrywood" finish I used on the legs. The fence is 24" long, 3" high, and the corners were rounded with a jigsaw. I drew the rounded corners with the inside of my roll of blue masking tape. 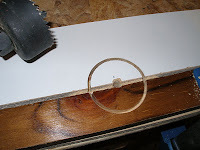 To cut the arch that goes over the bits, I used a 2" hole saw. I clamped the fence down with a sacrificial piece of scrap to balance the hole saw and keep it cutting straight. The waste was a pair of matched arches. I hung on to them, and I'm glad I did. They work great when bracing small glue-ups. I measured and re-measured and re-re-measured the holes for the T-Track bolts. This was one thing I really didn't want to mess up because it would mean starting the fence over from scratch. Once I had the locations marked, I used the Drill Guide from Rockler to keep the holes straight through the fence. After testing on some scrap, I decided the best diameter hole would be 5/16". That's cutting things pretty fine when working with 3/4" melamine. So precision was VERY important here. 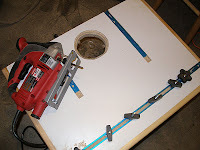 I mentioned in part 2 that while the original plan called for using my offset base for the Harbor Freight 1/4" trim router, after spending some time looking at the base on the table I realized it would weaken the top unacceptably. While I could reinforce the top to support it, that would add unnecessary complexity to the design. So I went with making a separate base plate for using with this table. 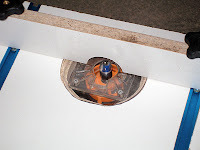 The base plate is a simple 5" diameter piece of .220 acrylic sheet with one side flattened and 4 holes drilled and chamfered to match the router. I located it on the table and sketched its outline. I grabbed my jigsaw and cut an opening 1/2" inside the outline then used the trim router to cut a rabbit around the edge, cutting to the outline. I realized I have a glaring hole in my router bit collection. I have no rabbit bits! Arrgghhh... I did the rabbit by hand and eyeball, which is why the edges are so rough. I did do some hand smoothing with sandpaper, but everything fit together so well I decided to leave it alone mostly. To make the opening for the bits in this part I decided to use my big fat DeWalt step drill bit. It went up to 3/4" which is adequate for 3/4's of my bits. If I use one of the larger bits I'll open it up some more. The flattened side of the base plate worked like a charm. 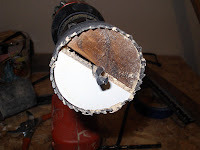 The router doesn't turn at all when running, even when making a deep cut with a 1/2" straight bit. The whole thing feels rock solid. These little HF routers make a heck of a racket when running, but in the table they're more like a "normal" router. The wood of the table absorbs the high frequencies, making it much nicer to use. I put the fence back on and ran some test pieces through, just to make sure it's stable and solid and won't fall apart during use. I'm happy to say it did NOT fall apart! I still have some things to do. I made a UHMW movable face for the fence to provide as close to zero clearance around the spinning bit as possible. For that I'm going to wait until I buy a slot cutting bit. So next week I'll add the faces. Last is where to mount the cleat. I have it on the wall right now, but I've been thinking how cool it would be to have it attached to the end of my workbench. That will take some thought and planning, as well as a slight reorganization of my garage... errr... shop. I may also have to reinforce the legs where the cleat mounts since having it there will mean quite a bit more weight will be on it than if it's just hanging from the wall. Even with those two things left undone, I'm considering this series finished. 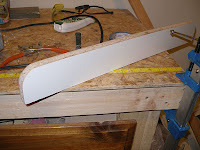 I'll do separate articles for the others since they can be applied to any tool, not just a benchtop router table. And the table is quite functional as it stands. Now go destroy some wood! EDIT: Oops! I forgot to put a pic of the finished router hanging from the wall! Here ya go!